The reactions of the pendulum will vary depending on the length at which the cord is held. If the cord is long then the pendulum will take more time to react. If the cord is held shorter or close to the pendulum then it will react very quickly. The length of the cord will depend on the task. Generally, a pendulum cord can be set by holding the cord short and slowly slipping it through the fingers whilst asking for the optimum length. At the point where the cord length is the best for you, the pendulum will move and this is the point to mark, tie a knot or slide the plastic adjuster to that point. 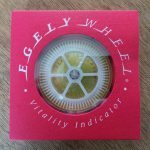 What is an energy pendulum? Energy pendulums are constructed by observing the principle of the natural radiation of matter and geometric form. Geometry, and symmetry can be seen in the design of an energy pendulum as a whole, as well as in the structure of the materials used such as crystals and minerals. 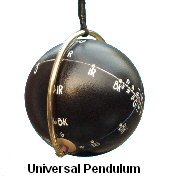 A pendulum with a cavity may also be given a geometry or design through the make-up of the sample placed within it. Homoeopaths utilise this principle to great advantage in not only determining the specific potency for an individual, but also in transmitting it. The techniques in using energy pendulums are different to those techniques in using the more general pendulums. THOUGHT – What properties does the pendulum have? THOUGHT – Energy follows thought. QUESTION – How do you know what someone needs with regard to a particular colour(s) at a specified intensity and for a finite duration? ANSWER – The pendulum indicates this.